Liverpool dominated the early stages of their clash with Chelsea at Anfield on Sunday, but not everyone was too impressed with this from Mohamed Salah. The Reds talisman got himself into a dangerous position as he attacked David Luiz in the box, but he went down far too easily for many, as noted in the tweets below. 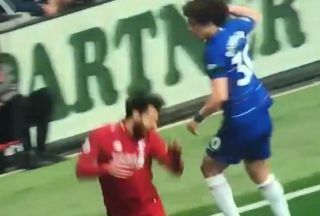 Naturally, a penalty wasn’t awarded to the hosts, with Luiz encouraging Salah to get to his feet as he was under no doubt that there was no foul. The replays showed that the Egyptian international did go down too easily in truth, with Chelsea undoubtedly spared the fury of being penalised for the incident. However, if they wish to come away with anything from Anfield, they will need to do more as Liverpool were a huge threat in the first half and had the lion’s share of possession and the best chances. Laughable dive from Salah. Not sure why he’s not been booked for simulation there. What an embarrasing dive from Mo Salah – another to add to the collection.